I am a 26-year-old deaf student. 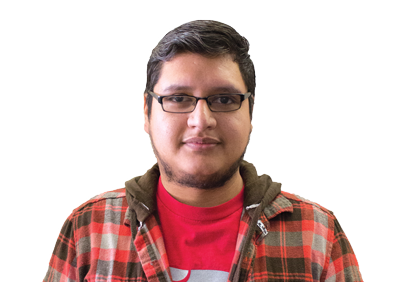 I have been at Eastfield since I graduated from North Lake College in 2014 with a computer graphics certificate, and now I’m studying digital media. I want to tell you a story about the deaf life and community at Eastfield College. First of all, not all professors are aware of how deaf students learn best in their classrooms. My hope is that more hearing people learn American Sign Language, even if it’s just the basics. Deaf students can have a better college experience when there is more communication in the classroom. I am shocked when I meet faculty and they know some ASL. It makes me feel like I am not alone in the hearing world. Hearing people worry about how to communicate with deaf students. But even if you don’t know ASL, you have other options. I work with The Et Cetera student newspaper without an interpreter. We mostly write notes to each other. Some of my coworkers on the Et Cetera are even making an effort to learn basic ASL. This is one of the reasons that The Et Cetera is a great place for deaf students. Many hearing people make an effort to be inclusive, but I feel like there is a lack of a deaf community at Eastfield. A couple years ago, deaf students had a table in the Pit where you could always find them, chatting and hanging out. Now, I look in the Pit, and it feels dead. Now, deaf students have graduated or dropped some classes, and the new deaf students hide from the hearing. I feel alone at Eastfield because other deaf students are not around campus. The only people I can really chat with are interpreters because they know ASL. I want Eastfield to work on building up the deaf community. One of the easiest ways to do this is for the Disability Services Office to host National Deaf Awareness Month events in September to increase awareness of deaf issues, culture and community. Deaf Awareness Month is a big celebration that encourages everyone to come together for education and fun. Four years ago, I was president of the Deaf Club and the host of Deaf Awareness Month at North Lake College. Now, I am here and don’t see Eastfield doing anything for Deaf Awareness Month. I do understand that Eastfield honors Veterans Day and Women’s History Month, but why not honor Deaf Awareness Month as well? If we did have events for Deaf Awareness Month, I would not want a boring lecture. Instead, we could have visual events like ASL storytelling, treasure hunts and games. I would love to go to these events if the Office of Student Engagement and Retention and the DSO would host them. Eastfield could also recruit new deaf students from high schools and let them know they have a place here. If we build up the deaf community, Eastfield could be one of the best schools for deaf students. President Jean Conway knows me well as a deaf student, but I want her to see many deaf students in the Pit or hanging out on campus. I wish Conway and other administrators and faculty could learn basic ASL to communicate better with deaf students. Another issue deaf students face is they commonly struggle with English because they can’t hear spoken English when they are young. We learn through reading and writing only. Because ASL is a visual language, it has a very different grammatical structure than English. For example, in ASL, we never use be verbs, articles (a, an, the) or conjunctions (and, or, but). Some parents don’t always understand how to teach their children English. Some deaf students are better at English because they studied without deaf culture. Deaf students at Eastfield don’t always need a high level of English proficiency because they want to study in more visual career fields, such as digital media, mechanics and welding. However, it is difficult for deaf students struggling with English to be properly placed in ESOL and developmental courses. I would like to see the Arts and Communications Division work with the Disability Services Office to fix the system for deaf students. Many cannot take core classes due to low Texas Success Initiative test scores. The director and staff of the Eastfield DSO are the best in the entire district. The DSO can also create workshops for faculty and staff to teach them more about deaf students and deaf culture. My goal is for the Eastfield deaf community to grow with education and a strong sense of deaf pride. Eastfield College could set an example for other DCCCD schools and future deaf students.